This article reviews, GuitEarIt, a computer game that trains you to recognize guitar chords by ear. I got this game as a free bonus with the Jamorama guitar course and I have found it a fun and effective way to build my ear skills. Read the review to learn how GuitEarIt can help you improve your ability to recognize guitar chords by ear. Learning to recognize chords by ear is an important part of learning to play guitar. It will help you to identify the chords in your favourite songs so you can learn to play them. You will also be able to join in with a jam session or play along with a band more easily when you can recognize chords and chord changes by ear. GuitEarIt makes training your ears fun by turning it into an easy to play game. It's a software program for PC or Mac computers that will give you practice recognizing chords on the guitar by ear. GuitEarIt can be bought on its own or you can get it as a free bonus when you buy the Jamorama guitar course. How Do You Play and Learn? GuitEarIt plays you a series of chords strummed on a guitar and proposes four multiple choice options for the sequence of chords that was played. You have up to four guesses to identify the correct sequence of chords and you score points according to the number of guesses you take to identify the chords - the fewer guesses the more points you get. Your objective is to score enough points to move on to the next level where you'll be trained for more guitar chords played in more complex progressions. As the games get progressively harder you get better and better at recognizing more varied chords. 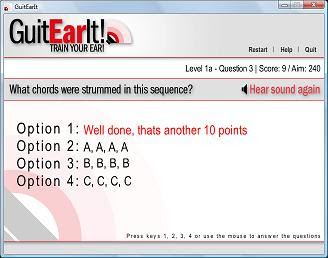 GuitEarIt is very easy to install and play and can be used by any guitar player wishing to improve chord recognition skills. The game requires no guitar playing skill so it is suitable for complete beginners as well as more advanced players. It is very easy for children to use too. You'll get most benefit from GuitEarIt if you use it regularly - a little session every day being ideal. It takes only five minutes to play a game so this shouldn't be too hard even for time pressed guitarists. GuitEarIt is a simple yet very well designed game that really works. Regular practice has brought me noticeable improvement in my chord recognition skills. At only US$29.95 it's a good investment in your guitar playing and musical skills. It's worth knowing that you can also get it as part of the Jamorama guitar learning course, for only a few dollars more than the price of GuitEarIt you get a whole multi-media guitar learning course too.